The islands of Cape Verde were uninhabited when discovered and claimed by Portugal in 1456. A Portuguese colony was established in 1462. The islands were united as a single crown colony in 1587. 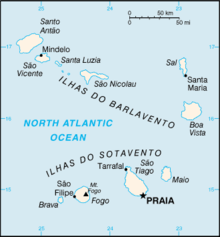 In 1951, the islands became an overseas province of Portugal. Autonomy was granted in 1974 and independence was granted on 5 July 1975. ^ a b Carlene Recheado (September 2010). "As missões Franciscanas na Guiné (século XVII)" (PDF). Universidade Nova de Lisboa. p. 10. ^ a b c d e f g h i Maria Teresa Avelino Pires (June 2012). "O exercício do poder na ilha de Santiago entre 1767 e 1796" (PDF). Instituto de Investigação Científica Tropical.